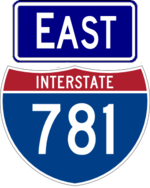 I-781 is a short interstate running from I-81 to Fort Drum. It serves as a bypass of NY 342 (formerly the busiest two lane road in the state) for traffic to both the fort and the north country via US 11. 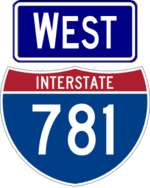 Design began in 2003 and construction concluded in 2012; the road was designated NY 781 internally before being added to the interstate system during construction by FHWA.